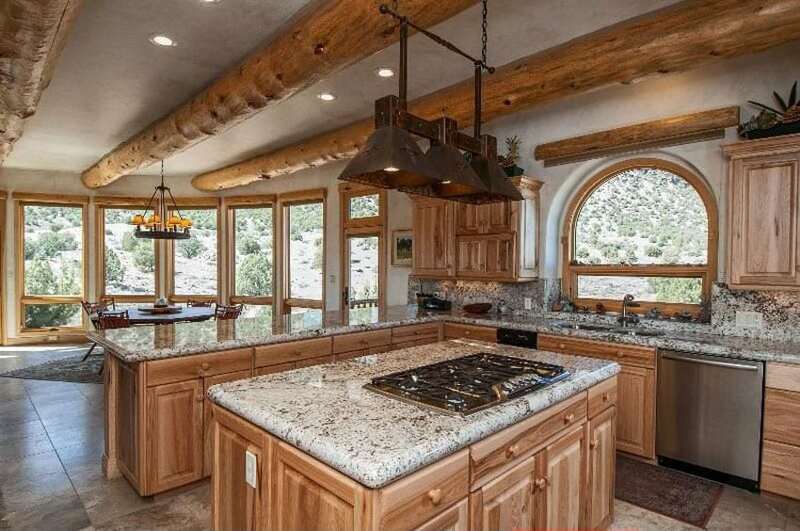 This gallery of beautiful rustic kitchens showcases the warmth or real wood cabinetry, natural stone & wood countertops, weathered exposed beams, and rich hardwood flooring. 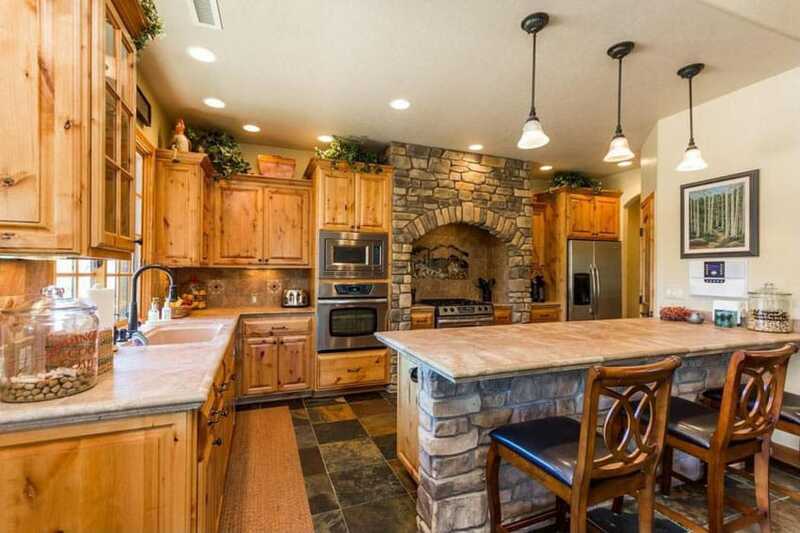 There’s nothing like the warmth and charm of a rustic kitchen design. This style looks inviting in practically any type of home whether its in the countryside, or city. 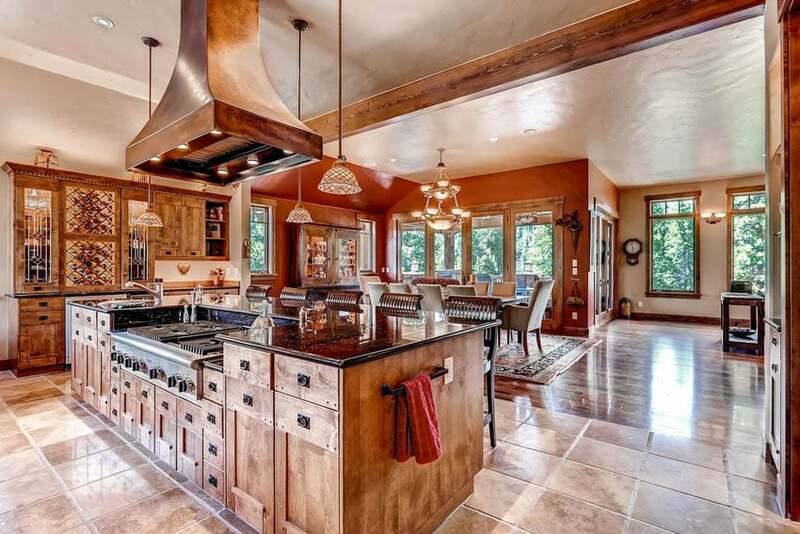 Below are luxury kitchens with a rustic country style to provide design ideas and inspiration for your next renovation. 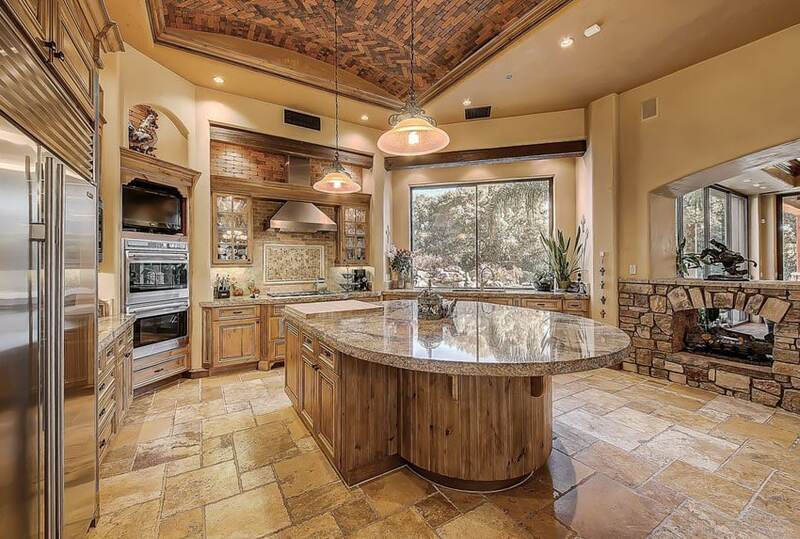 The rustic kitchen in the picture above employs an exquisite use of Santa Cecelia granite on its rounded kitchen island and kitchen counter; the polished look really brings out the brightness of the room. On the floor, we have randomly tiled travertine tile flooring, whose yellow tones are mirrored by the painted walls of the room. 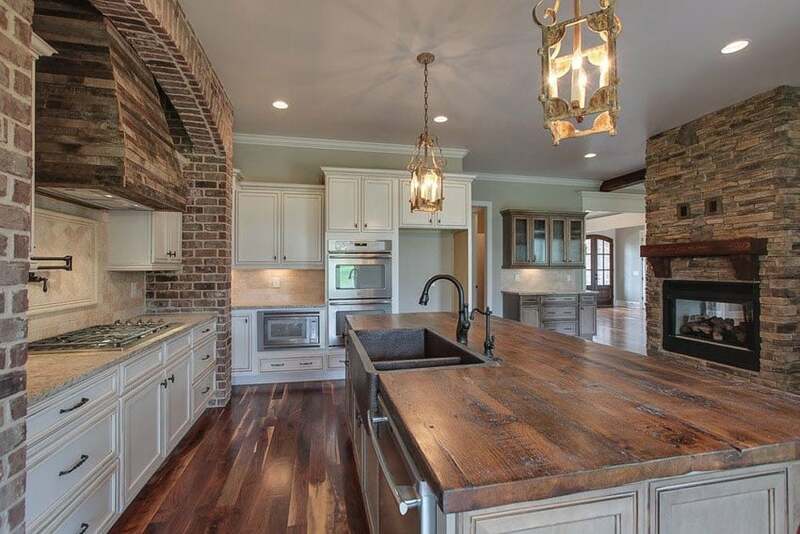 We have subtle yet effective hints of architectural character seen in the raw, almost unfinished textures of the wooden cabinetry, stacked stone fireplace, and arching brick ceiling. 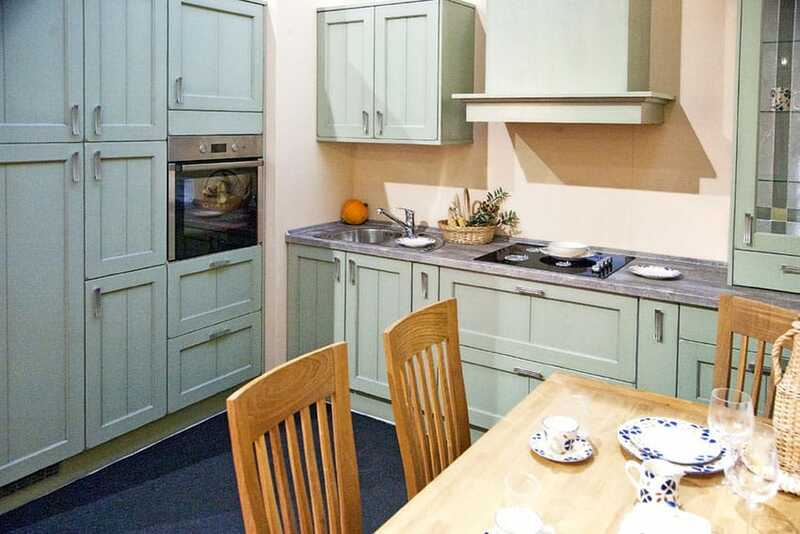 There are many differing opinions on how to get the genuine warmth and feel of a rustic style kitchen. 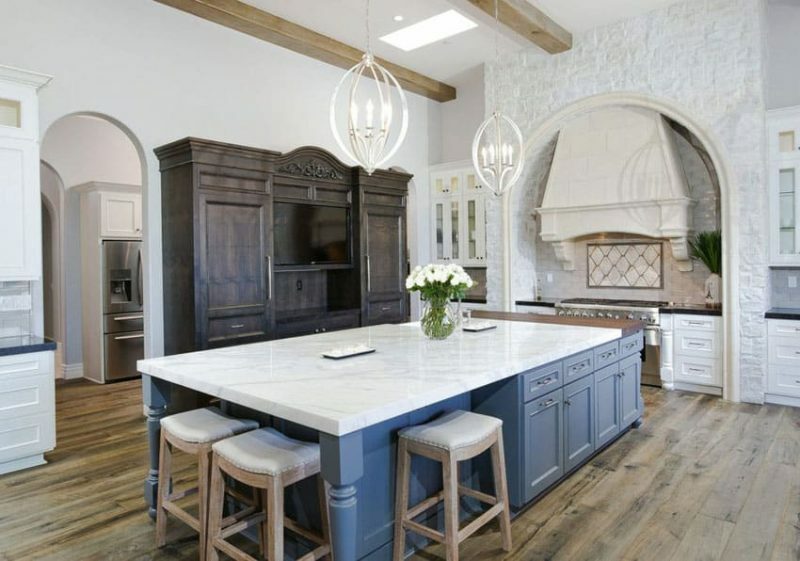 From rustic wood cabinetry, painted cabinets, backsplash tile, elegant lighting, weathered beam ceiling, stone surrounds and butcher block countertops, there are many way to bring elements of this style in to your home. Brown and beige tones aren’t the only ones capable of creating rustic charm – here we have a generous use of pristine ivory white to create a welcoming and homey vibe. In this beautiful country kitchen, white cabinets contrast with the faded tan of the hardwood floors and exposed beams in the ceiling, as well as the bold blue gray of the island cabinetry. The Bianco Venatino marble surface goes with the white theme and is a beautiful choice of finish. The painted white bricks of the accent wall and range area adds even more personality to the space. The center dining island of this warm country kitchen also serves as a functioning dining table with matching high-leg stools and tabletop decor. 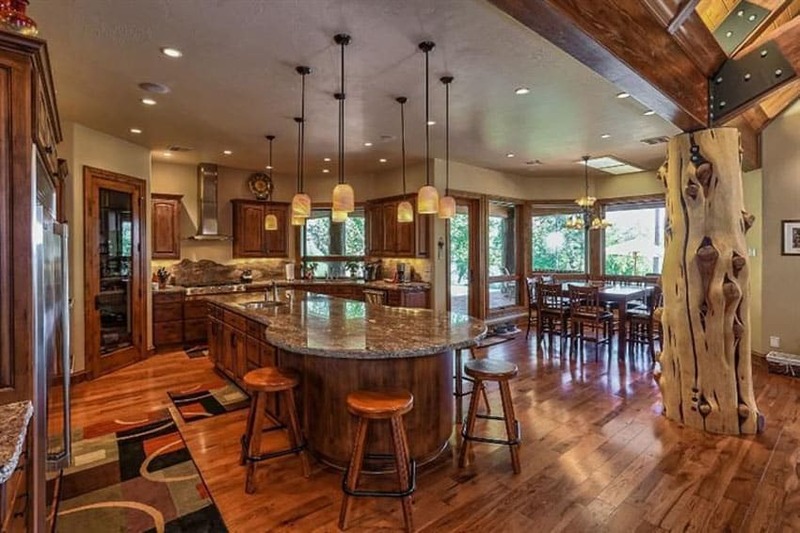 The raised panel cabinets and other kitchen cabinetry are made of the same wood as the wooden floor boards and so really create a nice brown motif for the space. The sloping ceiling is lined with exposed wooden beams that also match the aesthetic of the room. The faux stacked stone treatment of the limestone counter top island as well as the surround of the range and oven area really sets the tone for this room. The used tiles of the flooring are also creatively varied in look and style to make the space feel lively. The raw texture of the tan oak wood cabinetry of the space gives this rustic kitchen a nice helping of warmth and life. This traditional kitchen is designed with a custom-made island with a conveniently built-in contemporary style under-mount kitchen sink. The attached peninsula and breakfast bar has the same gray marble stone counter top finish as the island. The somber tones of the counter top really complement the beige and browns of the marble floor tiles and kitchen cabinetry. The rustic look is completed by the exposed wooden beams of the ceiling. Dark interiors can also be used to create intimacy and personalized charm. The cabinetry, in a complete 180 from the previous examples, was painted a dark brown – almost black – tone. 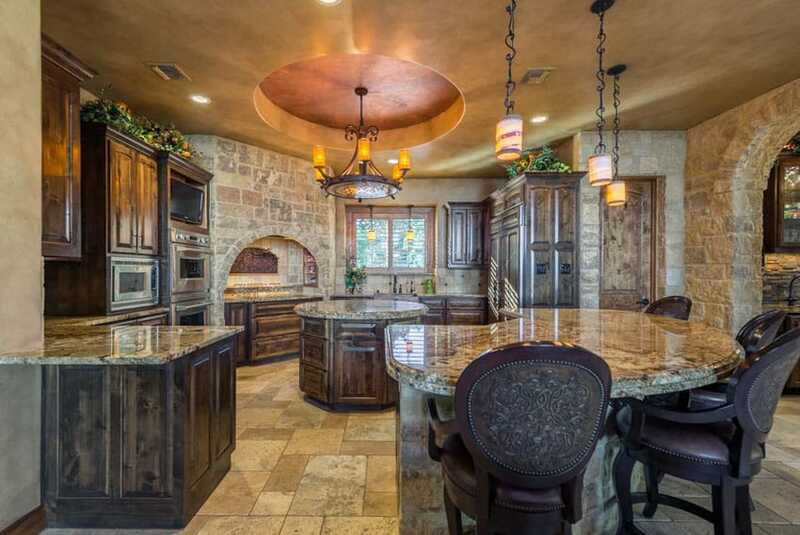 The stone oven hood is a nice touch that gives this space a personality. Clay stone tile flooring has an orange tint that is matched by the faux brick treatment of the range hood as well as the colored marble counter top of the kitchen island. 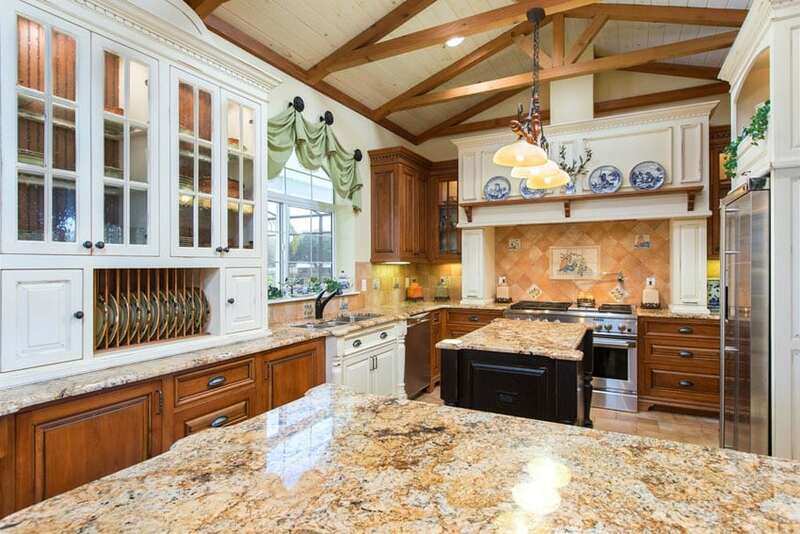 The Azurite granite island of this kitchen has a high-end feel due to the carved wood cabinetry and counter side. The travertine floor tiles is a good match to the overall feel of the room. 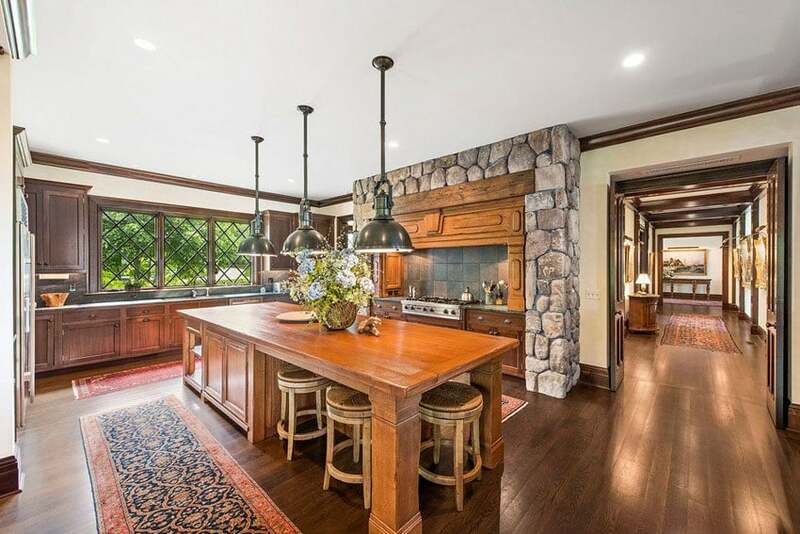 Different elements add to the charm of the space – the stacked stone facade of the fireplace and walls, the rich brown cabinetry of the kitchen, and the wooden exposed beams and ceiling. The six-light pendant lighting is a good touch. The dark granite stone counter top is not only used for the main kitchen counter area but also fro the kitchen island and breakfast bar. The farmhouse sink used on the counters give off an industrial feel and really makes for a good design element that creates a rustic feel. The stone fireplace is made of natural stacked stone – the combination and stone and the wood of the floorboards and cabinetry is a timeless example of complementary materials working together to create a good interior space. Rustic kitchens are known for their raw and unfinished designs. When done clearly and deliberately, the rustic style has the potential to really define the look of a kitchen. In this example, the thoughtful use of natural, stacked stone is a good choice that goes with the use of upholstered, re-purposed wood for the granite breakfast bar. The generous use of wood doesn’t stop there – we see it used for the exposed structural beam system in the ceiling, the floor boards, as well as the cabinetry and seating furniture used in the room. Home kitchen designs are made to be welcoming and cozy as most personal spaces should be. 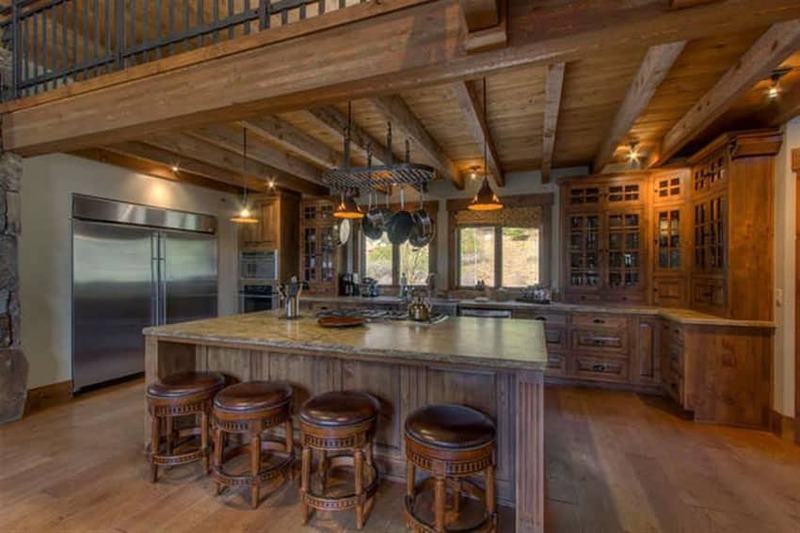 In this picture, we see that the kitchen of this rustic abode is located underneath the second floor mezzanine area, this gives the kitchen a good sense of proportion and scale while keeping it open to the rest of the house. 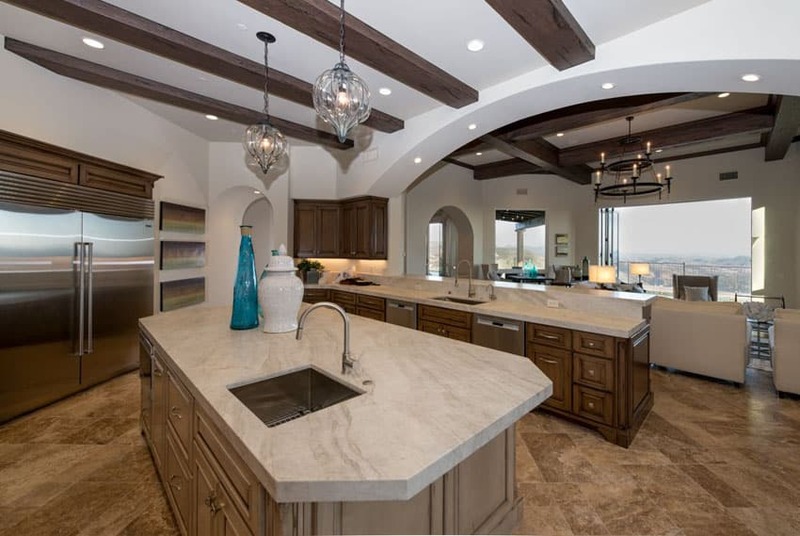 The wood beams used on the balcony can be seen from the kitchen and goes well with the other wooden elements in the space, such as the floors, the sides of the granite-top kitchen island and main counter space, and the different cabinetry of the kitchen. This rustic kitchen has Andino white granite counter tops and back splashes whose white and black palette go with the grained aesthetic of the cabinetry of the kitchen. The porcelain tile flooring is also a good choice of finish for this particular example. The exposed beams of the space are raw logs that really give this space a nice, natural feel. The cupola ceiling really set the precedent of the use of curvilinear design elements in this traditional rustic kitchen. The wrought iron chandelier and pendant lights have designs that employ curves, sweeps, and swirls. 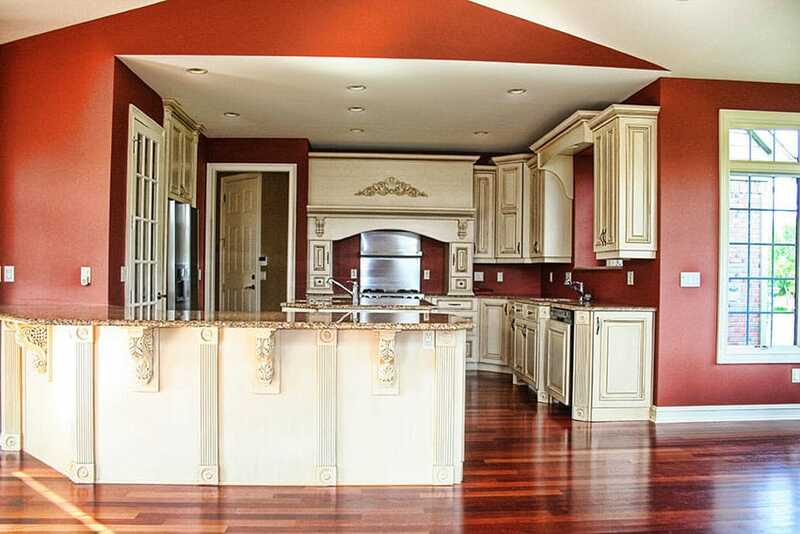 The central kitchen island is circular, while we have a curved breakfast bar to the side of the kitchen. The counter top materials for the kitchen is a beautiful granite finish – this matches with the raw stacked stone of the archways in this kitchen design. The travertine floor tiles are a nice finishing touch to the room. The maple hardwood floors are finished with a rich and shiny gloss that really makes the room pop. In this example, we have a very creative artistic centerpiece in the form of the decorative tree trunk the middle of the room. The custom-shaped island is designed to provide a small dining space at the end of the counter. Elsewhere in the room, we find wooden breakfast bar stools and a dining table set, wood cabinetry and shelving, and the use of view glass doors and windows to let sunlight in. The minimalist yet extremely functional pendant light were also good finishing touches to the design. The U-shape layout used for kitchens is good for maximizing usable counter space in smaller floor areas. This country style kitchen uses a steel gray granite as its counter tops – this type of material works great with rich, brown cabinetry, wall sidings, and floor boards such as the ones used in this design. Additionally, another good design element is the accent wall of the space which uses rough-cut stacked stones to complete the cabin aesthetic of the kitchen. 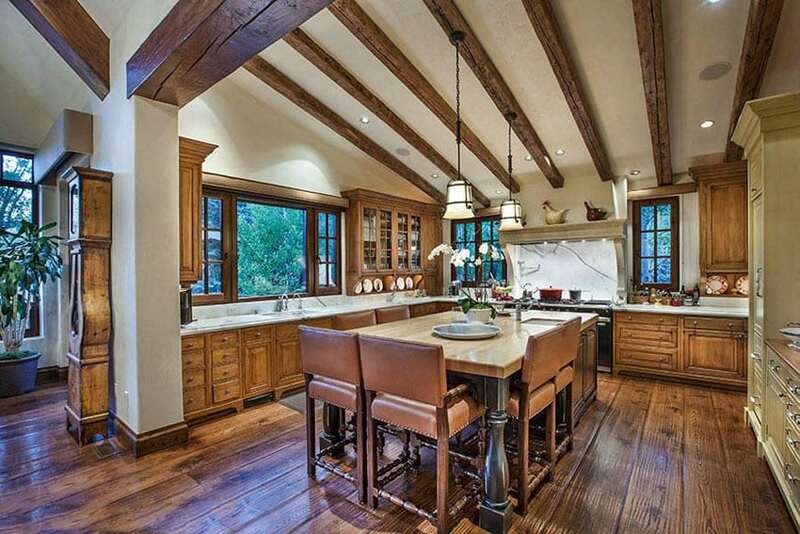 This beautiful kitchen design uses rustic custom cabinetry made out of varnished yet relatively raw wood. 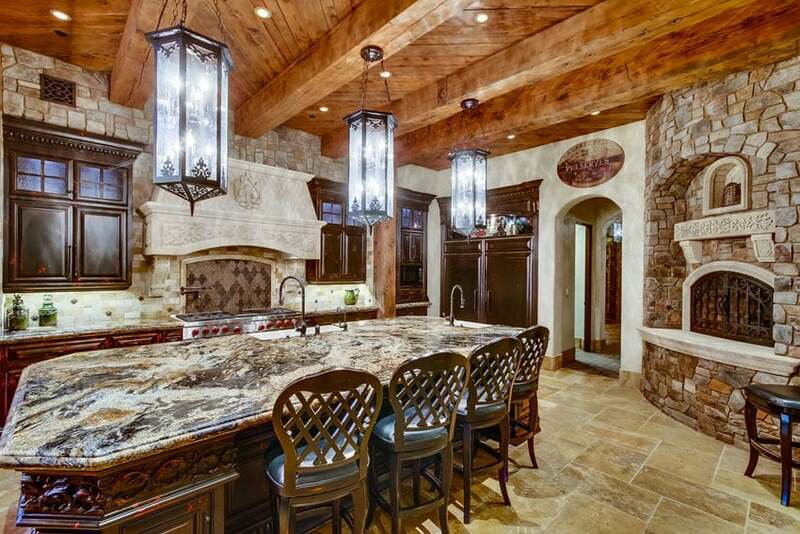 The central kitchen island even has intricately beautiful carvings on the side of its counters. The counter top itself is made out of stylish red onyx that has a shade of dark brown-red that goes with the rest of the interior. The herringbone brick floor pattern grounds the design while above, we have exposed raw wood beams and a useful skylight. Open layouts are good for kitchen since they make the space feel bigger and more inviting that having the cramped or stuck in a corner. As in this example, they’re usually put next to living rooms or dining rooms for ease of access. The kitchen island here has a built-in range and range hood as well as a kitchen sink mounted atop the black granite counter top. The custom cabinetry of the kitchen is made out of finished teak wood and is made to be clean, simple, and stylish. 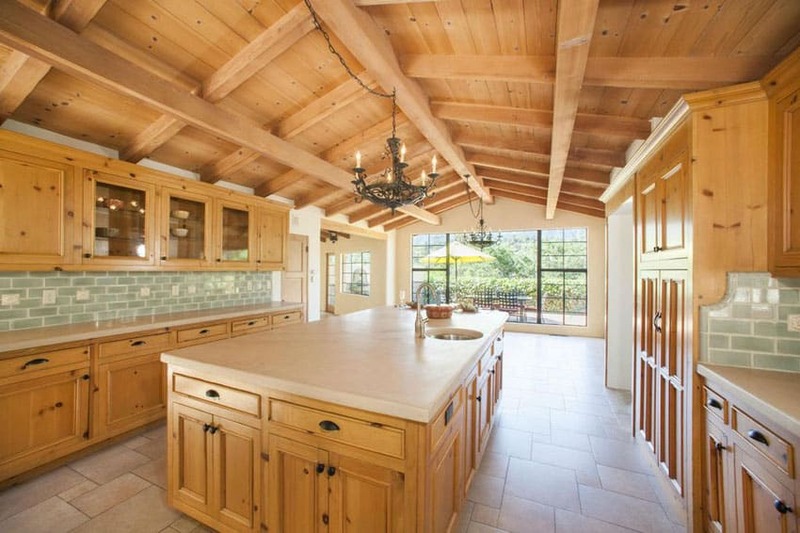 This wood kitchen has light, clean teak wood used in the sloped exposed beam ceiling, the beams themselves and the overhead and under-the-counter cabinetry of the kitchen counter as well as the island counter. The actual counter top is made out of plain white solid surface marble stone, with the island counter top having a built-in under-mounted circular kitchen sink. The randomly tiled porcelain floors are also a good touch and reflect a lot of light from the large view windows at the far end of the kitchen. A more subtle yet just as important design feature that really breathes life into the space is the green subway tiles used as back splashes. This bright kitchen has its large glass windows, clerestory windows, and view doors that lead to the patio to thank for its airy and bright ambiance. Aside from glass, almost everything in the room is made out of wood – the cabinetry, the exposed rafters and beams, and even the floor boards. 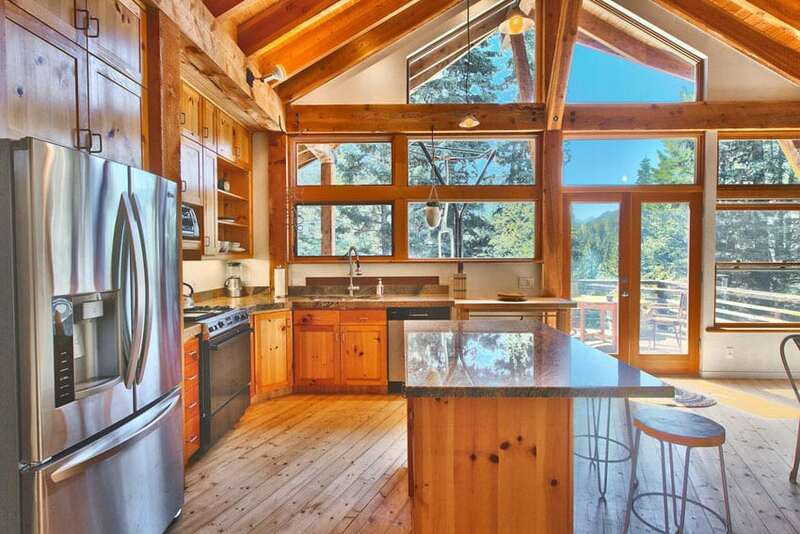 This mountain cabin kitchen really uses its locational context to create a space that’s unique and absolutely beautiful. 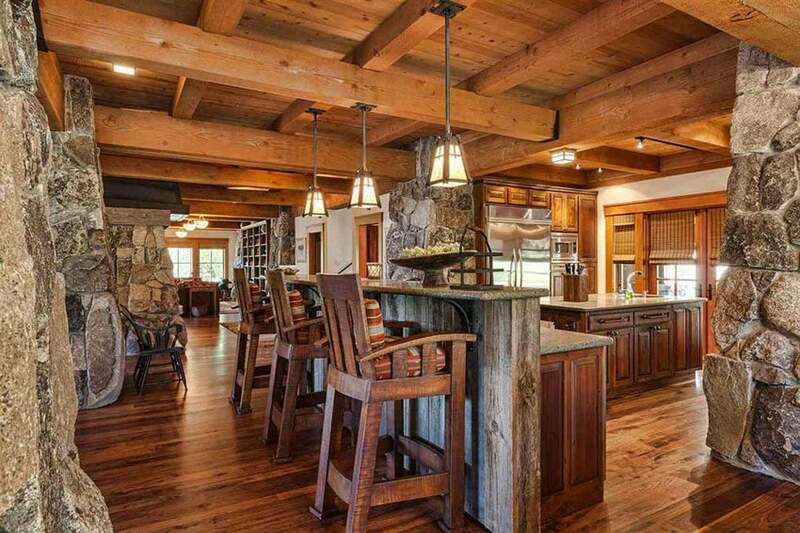 Many rustic kitchens utilize wood finishes such as knotty pine, alder and hickory to bring the outdoors inside. Clean and bright are the two features of this bright brown and beige kitchen. The matte faux wood laminate finish of the cabinetry in this kitchen are neat and just textured enough to be charmingly rustic. Expansive window views and the glass of the view doors let in a lot of light and are even more exemplified by the polished marbled floor tiles. A good example of a country style design, the painted blue island as well as the polished concrete floors really make the room. The rustic white cabinets contrast beautifully against the wood accents and dark flooring. 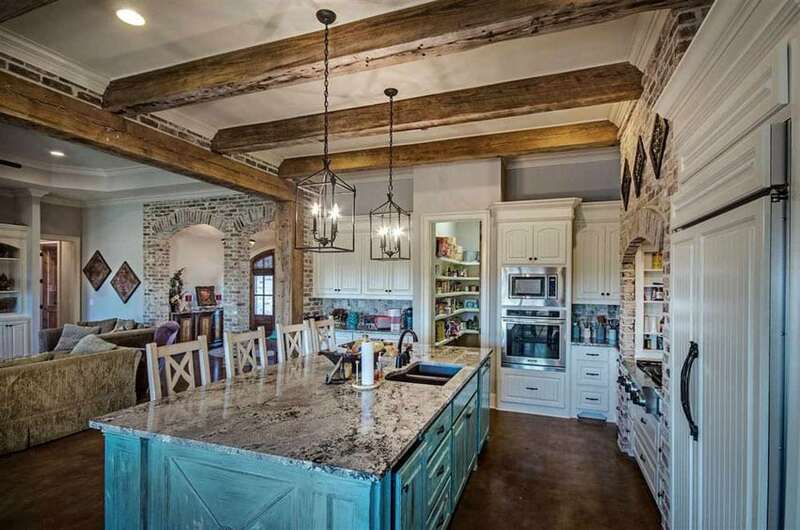 In addition, we have the ash gray granite island, the stacked brick archways, and the raw, weathered wood beams of the ceiling to really make this kitchen unique and dynamic. The kitchen seen above employs a more traditional approach to design, but is just as striking and effective as its more contemporary kitchen counterparts. 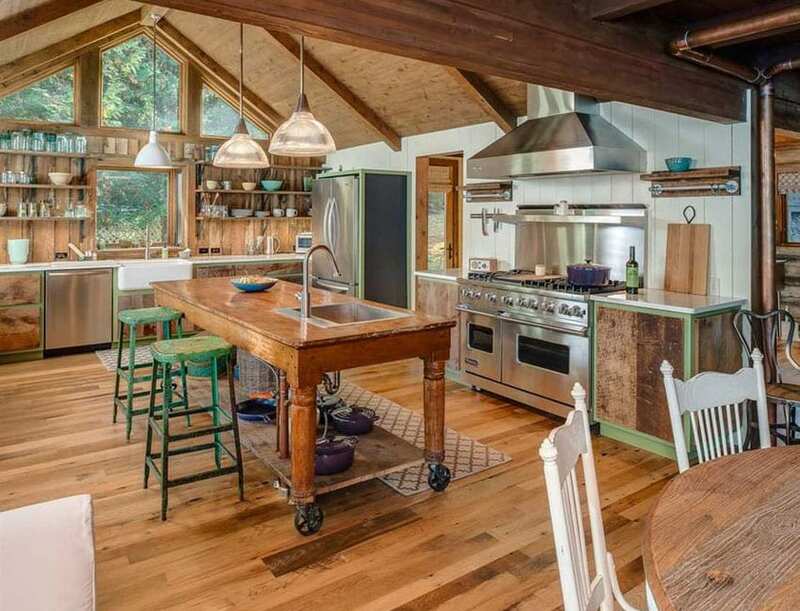 The butcher block island gives users ample counter space while employing amazingly rustic design elements – the varnished dark oak board counter top finish and the wrought iron barn style kitchen sink. 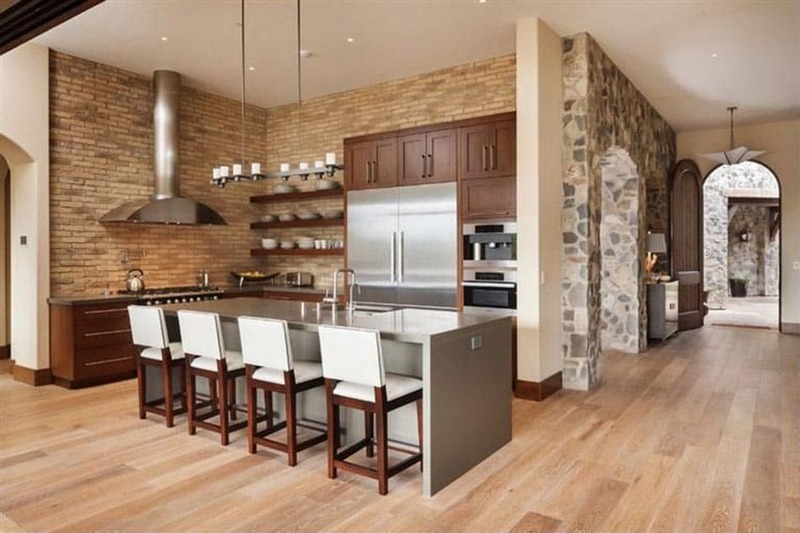 The rest of the kitchen uses a quaint travertine back splash as well as a stacked brick accent for the walls, range surround, and columns in the room. The lantern-style pendant lighting is also a nice touch. 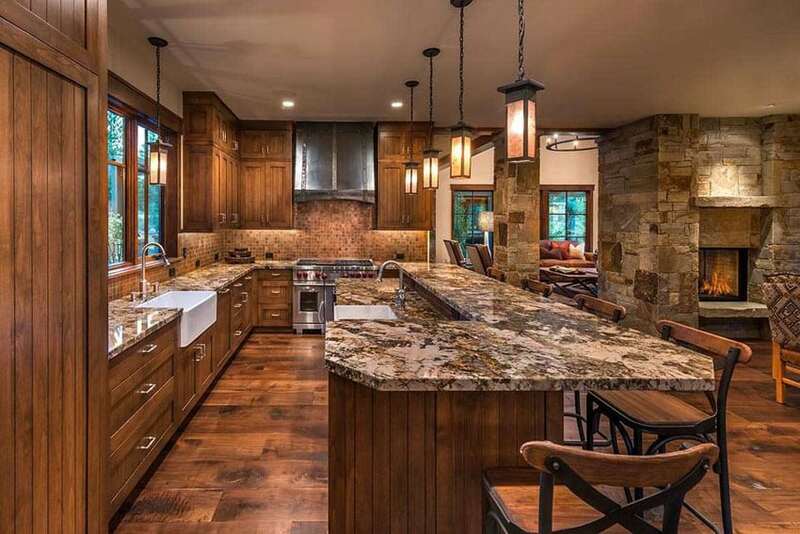 Rustic kitchens should be inviting and utilize craftsman cabinets and finishes to match a homeowner’s specific sense of style. 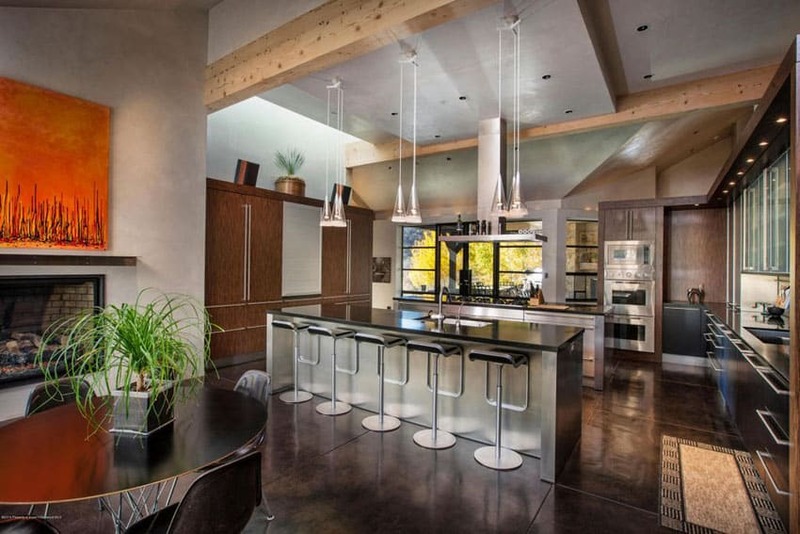 A home’s heart is arguably the kitchen space and this kitchen design really shows the spirit of the home. With its country style aesthetic, there are different homey knick-knacks and shelf-top decors that are on display. 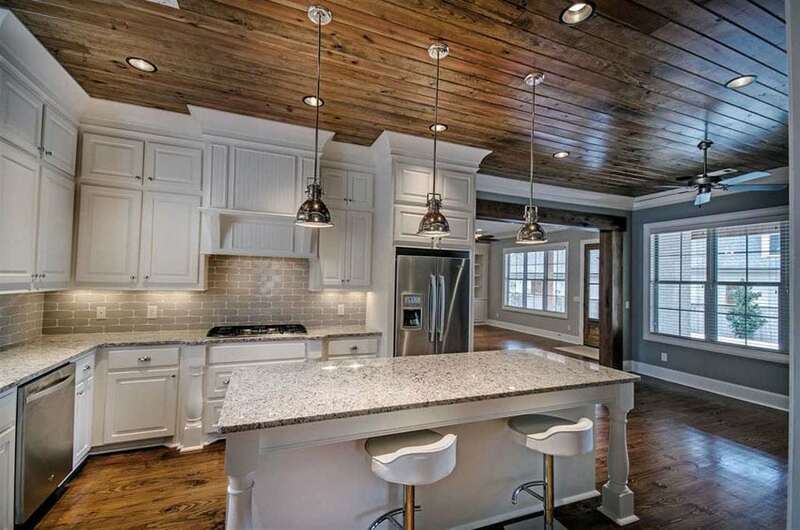 The white wood plank sloped ceiling has exposed wooden trusses, the kitchen cabinetry is in complementing white and brown finishes, and the counter top is a speckled tan granite. The room is chock full of personalized spirit that makes it really feel like you’re welcome in this space. Light and dark tones and materials can be used to contrast each other and really bring out the strengths of their opposites. This kitchen has white cabinets and light gray Snowfall granite counter tops. The legs of the island counter and the kitchen counter as well as the trimmings of the walls are all in that same pristine shade of ivory. This all contrasts with the rich, dark varnish of the cherry wood floor boards and the wood boards used as ceilings in this space. The sleek design of the kitchen appliances, breakfast bar swivel chairs, and the hanging chrome pendant lights are all good choices for the space. Here we have a more minimalist interpretation of rustic design. 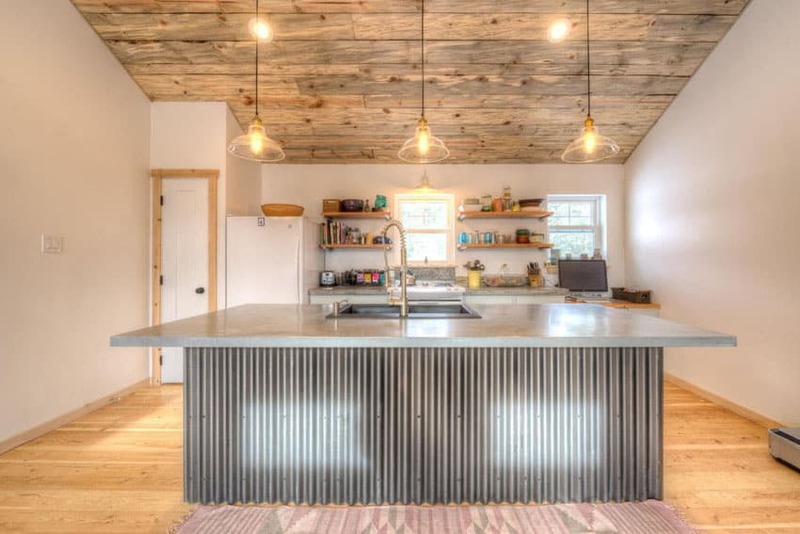 This kitchen has an industrial-inspired corrugated steel siding to the polished concrete island counter. The choice of pendant lighting is also contemporary and industrial. Wood was used generously in the piece – it can be seen as a a floor finish with the wooden teak floorboard and also as a ceiling finish for the slanted ceiling of the room. The rest of the space keeps with the modern and clean vibe by using white paint in the walls and non-ornamented shelving for the kitchen counter. This more contemporary take on rustic design has a smokey gray marble counter top used on both the main kitchen counter as well as the kitchen island and breakfast bar. The wood plank finish on the ceiling matches the polished pressed wood of the floor. The island counter also has a built-in cook-top that integrates well with the aesthetic. A more modern and contemporary take on rustic, this kitchen uses polished black concrete floors, stainless steel furniture and appliances, and chrome finishes to really create a sleek aesthetic. The counter tops are a stylish black solid surface finish that really match the concrete floor. Clean lines and bold forms were used in this design to really give it a unique character. Exposed wooden beams, wooden cabinetry, and raw concrete walls really add more charm to the space. 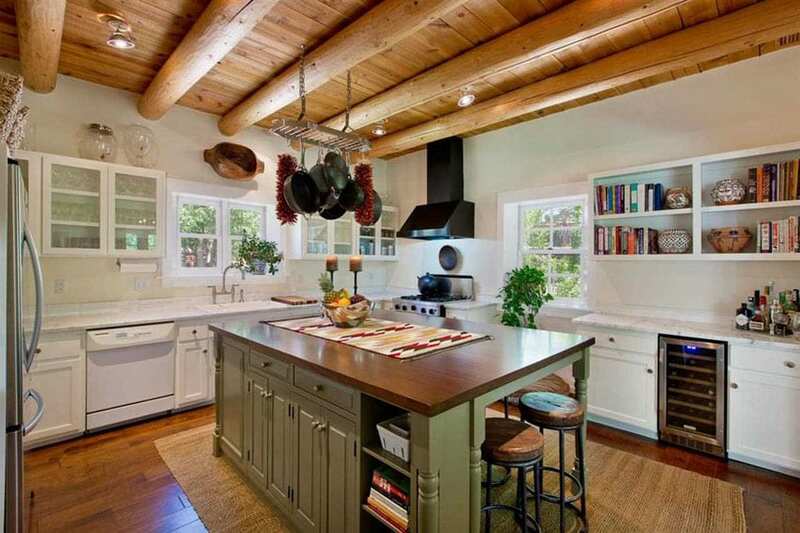 This contemporary rustic kitchen has hints of clean Scandinavian design mixed into it. The gray graphite counters and the brick veneer walls, not to mention the painted paneled wood cabinetry, were executed neatly and cleanly. The cherry flooring has a faded tan tone to it. At the side, we have a stacked stone archway that serves as an expression of the stacked stone facade in the exterior of the house. Overall, this design is stylish yet simple. 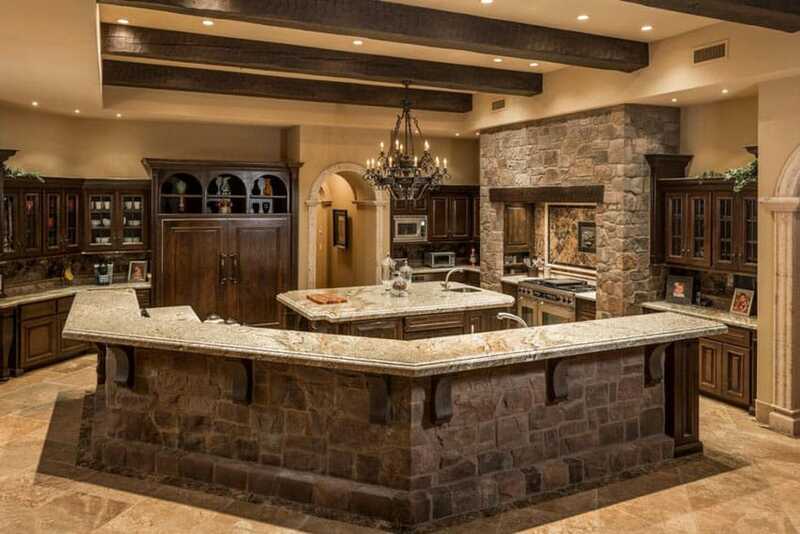 What really stands out in this kitchen design is the generous use of random stone floor tiles and the stacked stone look of the accent columns at the far end of the space. The spoke wheel design of the exposed beams on the ceiling culminates with a hanging wrought iron chandelier in the middle, right above the dining table. The rounded island of the kitchen is topped with Colonial cream granite and is illuminated by the focus pendant lights as well as the open windows that let a lot of outside light in. The custom stone surround of the range and stove of this piece acts as a bold accent and focal point for the space. The use of wood in different forms – the cherry wood of the floor boards, the teak island counter, and the oak cabinets – gives the space life and personality as well as a generous amount of warmth. The green island of this rustic kitchen is subtle tone of olive that really goes well with the browns of the kitchen island wooden counter top, wooden floor boards, and exposed beam wooden ceiling. The white cabinetry and shelving of the surround walls and main kitchen counter is a good foundation for the rest of the design and really opens up the room aesthetically. 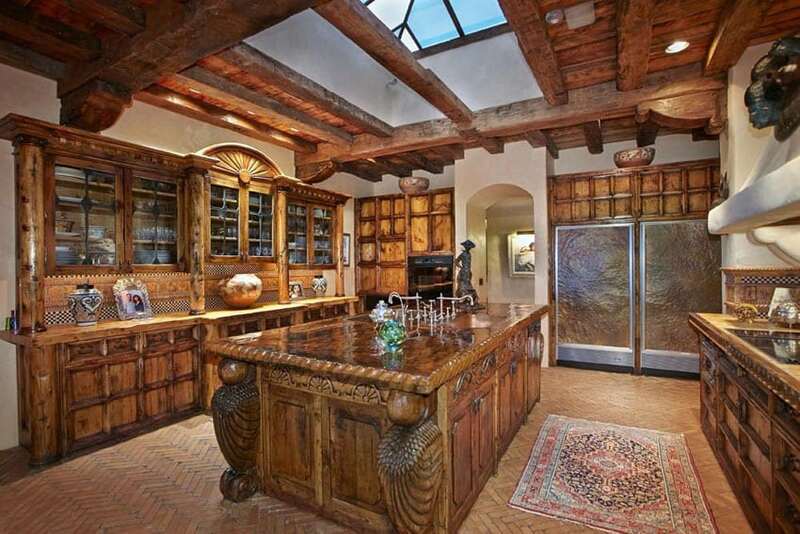 Rustic kitchens that have influence form the Mediterranean style look warm and inviting. 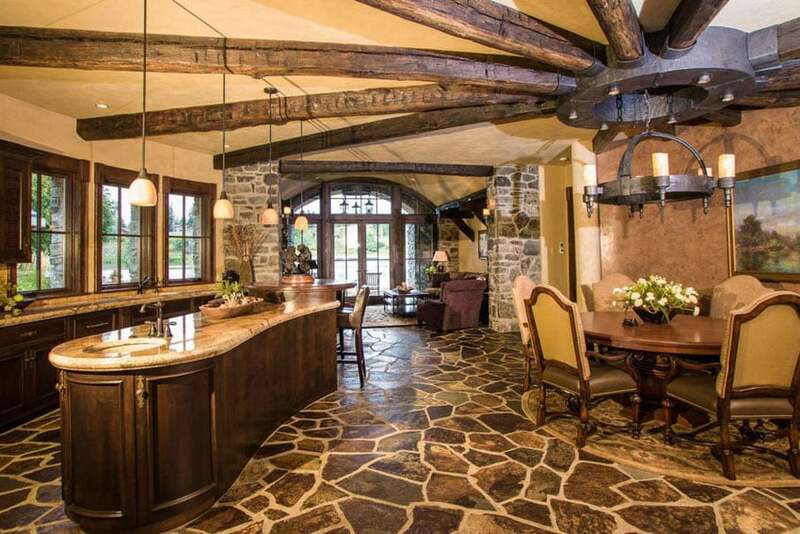 With its use of raw stone and dark wooden structural elements really creates a naturally rustic ambiance. That style used in this kitchen example has the space employing stacked stone sides for the range and oven surround as well as the sides of the kitchen island. The counter top used is Betularie granite and really goes well with the beige travertine floor tiles as well as the tan paint of the walls. 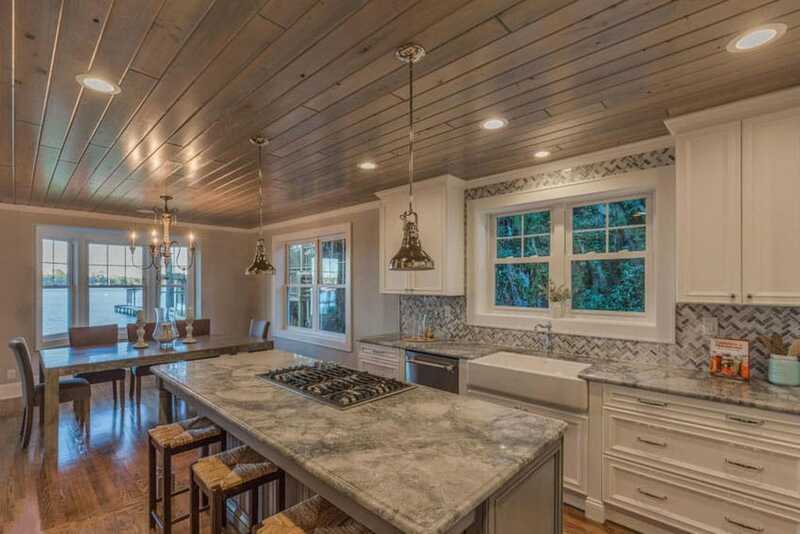 The exposed beams are made from the same shade of varnished wood as the cabinetry in the kitchen. This example of a rustic country kitchen is a perfect portrait of personality put into interior design. We have the quintessential wood beam sloped ceilings, varied tones in the hardwood floors, as well as bespoke furniture pieces in the re-purposed green steel bar stools, the rolling kitchen island with a built-in top-mounted kitchen sink, and wood panel sidings for the walls with the kitchen shelving. Pops of green are strewn across the room that match the greenery seen through the glass windows and clerestory windows on the far end of the room. 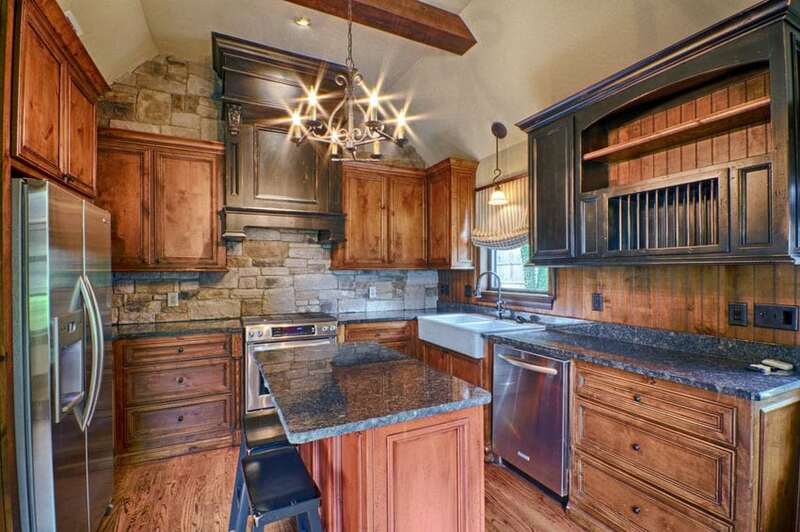 Smaller, more personal kitchens like this can still effectively pull of the rustic charm. Here we have quaint and clean-looking mint-green cabinets that really set the overall mid-century modern aesthetic of the space. The dining table as well as the accompanying dining chair set are all made of warm wood. The carpeted blue flooring and the tan paint on the walls really go well with the other colors in the design and create an intimate yet welcoming space. Color must be used effectively. In this design, for example, a very rich and subdued yet undeniably bold shade of red is used to give personality and vibrancy to the aesthetic of the room. This is brought out even further by the rich stains of the wooden floor boards. 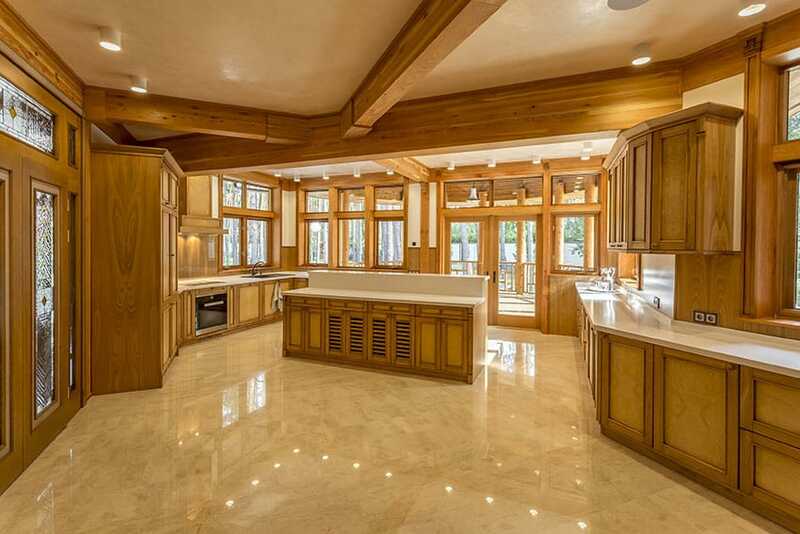 To counteract the richness and to prevent it from being too imposing, we have the cream colors of the paneled and carved cabinetry and counter sides of the the kitchen counter as well as its matching peninsula. 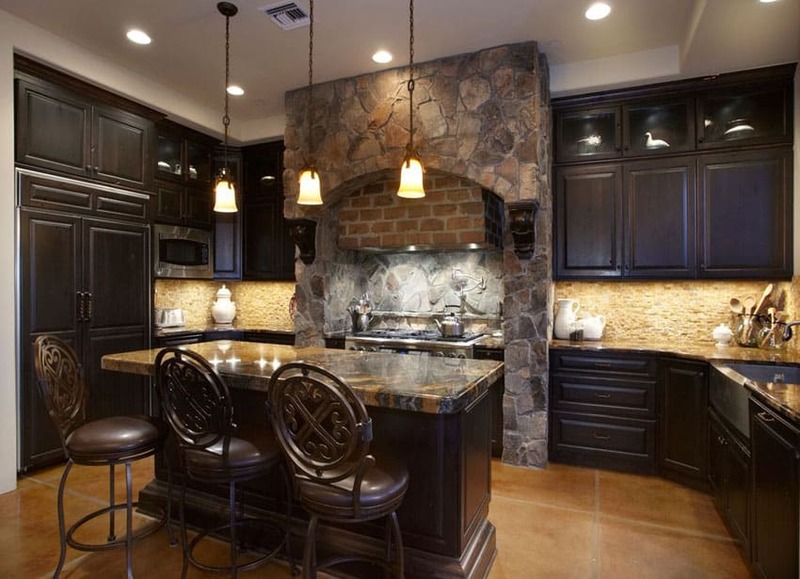 The granite used for the counter tops is a speckled shade of brown that really matches everything else in the room. 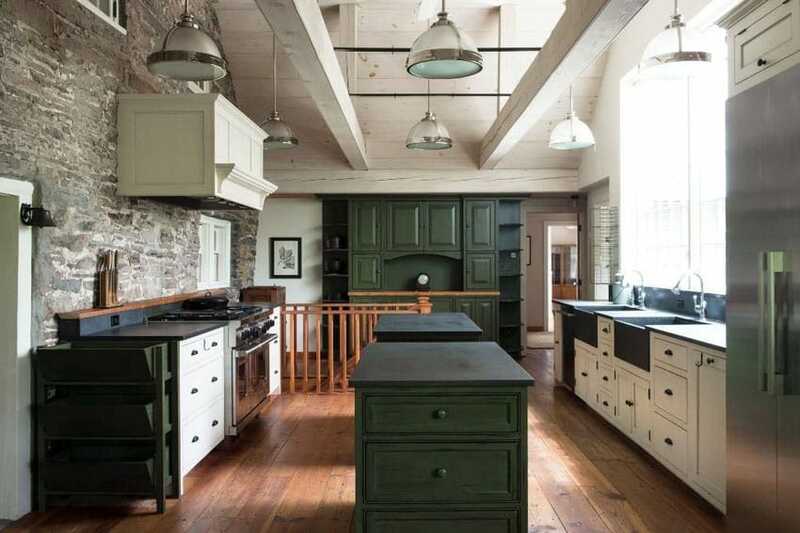 Dark olive green paint with matching matte white paint is used on the kitchen cabinetry and counter tops of this design. This color palette is clean and highly comforting. Add to that the rustic wooden floor boards and the raw unfinished stone masonry wall to the left and you have a highly effective second-floor kitchen space that really feels comforting and welcoming.